I originally wrote this post as a guest blogger for the PediaStaff Blog in February 2012. You can see the original posting here. It is published here with permission. If you could see me typing this article in my office right now, you could probably infer several thing about me. The array of papers and books all around me would tell you that neatness is not my best quality. The placement of my computer mouse would tell you that I am left-handed, and the fact that I am currently wearing workout clothes would tell you that I am planning to get to the gym at some point today. Most of us can make these kinds of inferences automatically; however, as you well know, inference does not come so easily to everyone. While my background is not in special education, I have certainly worked with many students who have social and language difficulties. I tend to come at learning from a “What can we do to make this activity fun and motivating?” perspective, which I think is useful for teachers of all populations. At its core, inference is using clues to come to a conclusion. This is awesome because most kids love puzzles…they love playing detective, and that is exactly what they get to do when they are learning to infer. 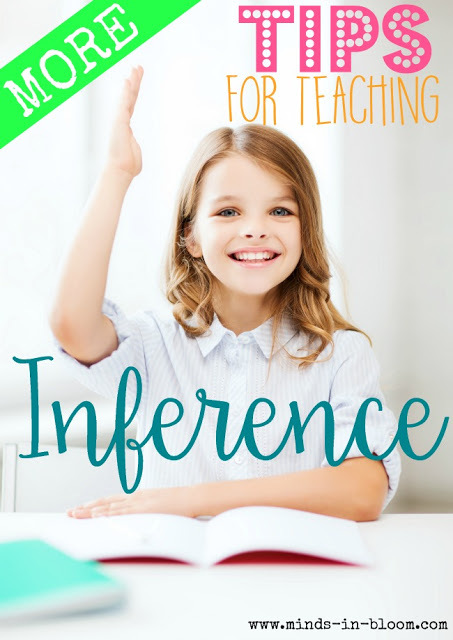 There are many, many terrific ways to teach inference. Here are a few of my favorites. Pinterest is, of course, an amazing resource. Find interesting pictures that can be used for inference and create questions around the pictures. How do you think the character in the picture feels? How does the picture make you feel? Why? What do you see in the background of this picture? How is the background important? Why do you think the illustrator used the color _______ for _________? Choose a concept word, such as “love”, “anger,” or “friendship,” and have students use magazine pictures to create a collage depicting that concept. Give students an opportunity to share their collages, explaining why they selected each picture. Ask each student to bring a picture of himself or herself from home and to create one inference question about the picture. For example, if the picture is of the student and his brother playing in the yard, and there are orange and yellow leaves all over the grass, and the sky is gray, the question could be: In what time of year was this picture taken? You could make the pictures into a bulletin board, a PowerPoint, or simply display them one by one with your document camera and discuss. Play a video with the sound off. Ask your students to infer what the characters are feeling. If you need to take extra time, you can pause the video to discuss a specific character’s body language of facial expression. Then, replay the scene with the sound to see how accurate the students inferences were. Inference with text is an important reading strategy. It can lead to greater understanding, as well as enjoyment of the reading material. After all, it is fun to make an inference…sometimes so vague it seems more like a hunch, and then have it confirmed later in the book. It kind of makes you feel super smart. Using the clue approach can be very motivating for reluctant learners. They are inference detectives, and their job is to look for clues (aka specific words and phrases). When students make an inference from text, be sure to ask: What makes you think so? Require the student to show which words or phrases led to the inference. When introducing inference, start with very short passages of just a sentence or two. As skills grow, so can the size of the reading material. 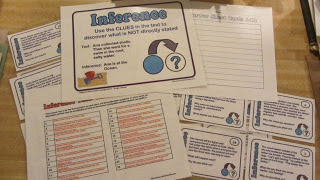 Create inference bookmarks for students. Students use the book marks to write down inferences that they find in their independent reading (one per bookmark). Require students to complete a certain number of bookmarks for each book they read. An inference chart would be a variation on this idea. When reading out loud, pause when you come to a section that contains inference clues. Question the class about what they can infer from the passage. Bring a backpack from home that you have filled with specific items. Tell your students that it is their job to learn as much as they can about the owner of the backpack by examining the contents. Pull out one item at a time to discuss. Group items that seem to go together to tell a story (for example, colored pencils, an eraser, and a sketch book). You could also do this in small groups by giving each group a different backpack. Have your students create Mystery Bags at home to share. A Mystery Bag is a brown paper bag with a mystery item inside. On the outside of the bag, the student writes clues about the mystery object inside. One fun way to use the bags would be to number them and then have students walk around the room with a clipboard and a numbered answer sheet on which they record their guesses for each bag. Of course, you will also want to leave time for students to reveal their mystery objects. Consider the mime. Mimes are all about inference. If the audience does not infer, then the mime’s act makes no sense. If you can find a good mime video or see an actual performance, you might want to try it. You could also try having your students learn specific mime acts, such as pulling on a rope. By making your inference lessons fun, your students are more likely to remember the skills they have learned. And don’t forget task cards! Thanks for sharing. I have found that inferencing is one of the toughest skills to teach, especially with my students many of which are ELLs. I have used some of these activities, but I will be using the others as well. I love the idea of the students bringing pictures from home and writing questions about them. Sweeeeet, thanks so much for your insight and helpful words.